The annual Melbourne Food and Wine Festival (MFWF), in partnership with Bank of Melbourne, offers 10 days of bespoke epicurean experiences in one of Australia’s most culinary-driven cities. Kicking things off on March 31st, the 10 days that follow fall under varying pillars of Eat, Drink, Learn, Party, and Out of Town. Gourmet delights and tasting opportunities are around every corner. The final weekend of the festival will feature a dedicated wine program showcasing Australia’s lively wine industry. 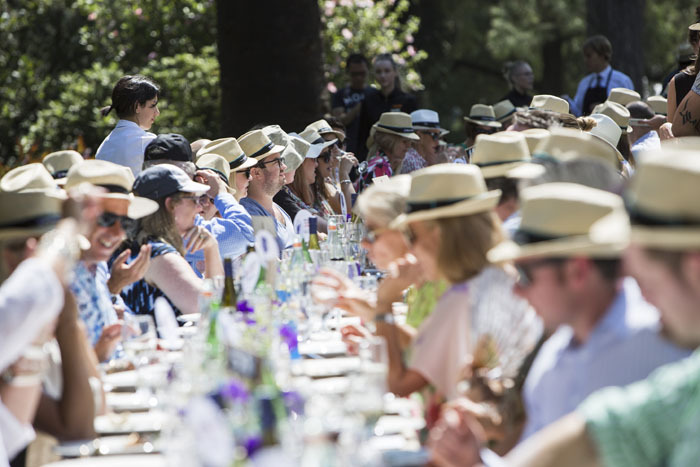 Coinciding with the World’s 50 Best Restaurants, the Melbourne Food and Wine Festival presents the perfect opportunity for sommeliers, chefs, and other food and wine industry professionals, to flock to the city. “Our selections showcase established wineries like Craiglee and Crawford River sitting happily alongside a delicious Alsace inspired blend of Riesling, Pinot Gris and Gewurztraminer made by an emerging superstar winery called Schmölzer & Brown,” explains Protheroe. Visitors will get a sense of the new generation of winemakers breaking through. Some examples, which are sure to make an impact, include Nick Farr (Farr Rising), Owen Latta (Appellation Ballarat) and Simon Killeen (Simão & Co.). “There is some classy Yarra Syrah and mouth-achingly-true to variety Aglianico too. A few others, but we can’t give it all away!” exclaims Protheroe. Winemaker Patrick Sullivan will be supplying two bespoke wines on tap for the event. They expect some apprehension about drinking wines on tap; however Protheroe feels it will be a pleasant surprise for the guests. “We look forward to seeing Patrick’s keg wines when they are first tapped. I am not sure we will get a chance to test how long they keep fresh as I think they will be one of the big hits at the bar. In general, if it gets more people enjoying wine, then it can only be a good thing,” says Protheroe. Tap wine also minimizes waste, and is a great way to enjoy the local wine. Nonetheless, Sullivan says he wouldn’t send it outside of Victoria because it doesn’t travel easily. In the spirits department, MFWF cocktail consultant Fred Siggins will be on hand creating a signature festival cocktail for those looking for an alternative to wine. ‘The Flowing Bowl’ punch & cocktail-making party is not to be missed, where Shaun Byrne of Maidenii Vermouth will guide guests in crafting and enjoying their own cocktails. “He’s got a fantastic palate and more knowledge than a library so it should be highly educational and delicious,” promises Siggins. Sullivan’s top recommendations for the festival are the ‘Italo Dining Disco Club’ - an Italian street party hosted by Sydney's dining maestros Maurice Terzini (Icebergs Dining Room and Bar, and Da Orazio Pizza + Porchetta) and Giovanni Paradiso (Fratelli Paradiso, 10 William Street), debuting their coveted event in Melbourne - and anything hosted by Tony Tan. And if you find yourself a willing driver, head out of town for the day to one of the regional long lunches, as recommended by Protheroe. However, there is plenty to be enjoyed within the city of Melbourne.